We are in Lower Egypt. 60 km south of Alexandria, at the edge of the desert, we are flying over a deep valley, hills rising on each side dotted with caves. No sign of a monastery, but in each cave you can imagine a monk. This is NITRIA (A word that comes from nitrum, the old word for saltpetre, nitrate of potassium; salt and soda were extracted here.). But this place was relatively near Alexandria, and there were many visitors. It is said that when Amoun the founder of Nitria, told Antony of this annoyance, they both went south, after the meal at the ninth hour, and founded a second monastic centre at the place where they arrived as the sun was setting. So, half a day's journey, about 18km, we find the next monastic centre called: THE CELLS because it consisted of small houses built next to each other. Each monk had a rough dwelling. Often one could build a cell in a day. They were made of mud and reeds, but they did have a bolted door. Sometimes, as in Nitria, they used a hole in the rock; the houses then had two rooms. Excavations here have shown that an anchorite's cell was in a courtyard surrounded by a wall where he could walk about. In this courtyard a well provided water to drink and to water the garden. The space between the cells was large enough so that one could be neither seen nor heard. But the desert was vast. When Palladius went there, he found 600 monks. That means a town 6 km in diameter. The church was in the centre. About 40 km further south, we find SCETE (A skete is a community of Christian hermits following a monastic rule, allowing them to worship in comparative solitude, while also affording them a level of mutual practical support and security.) another monastic centre of the same kind for those who wanted even greater solitude; it was 30 km from the Nile and even further from any town. Fairly soon, some more permanent buildings were put up in these places; the church where the monks gathered to celebrate Sunday, and a guest house. But the monks continued to live as hermits, apart. So we have three successive monastic centres in Lower Egypt. We will continue our flight, veering slightly to the right to find the valley of the Nile and we will fly over Upper Egypt and it's capital Thebes. Antony said he wanted to live in the Upper Thebaïd; that is where we are. Surprisingly, here it is the opposite to Lower Egypt, there are very few hermits, but we are flying over entire villages surrounded by a wall. Here is one, let us get out of the helicopter. We are at the foot of a wall about eight or ten metres high. We go to the right to find a door, but no luck, we have gone the wrong way and have to go nearly all the way round the wall to find the door, for there is only one door in the whole wall. At this one door, there is a porter who is very good at his job; he asks a lot of questions: " Are you men, or women? Are you catholics, are you unbelievers? Are you priests, monks, laypeople? etc... This is because everyone will be made welcome, but not in the same way: the ladies here, the tourists there, the poor somewhere else, the catholics in one place, the monks in another. We are monks, and so we can visit everywhere, but in the company of a monk. We begin by finding there are a great many inhabited houses with between 20 and 40 brothers in each house. We go into the first house, and ask the first monk we meet: "What do you do?". He replies: "I am a baker." Then the second: he too says: "I am a baker", and the third likewise. Is everyone a baker in this place? Then we go into another house and ask: "What do you do?". He answers: "I am a scribe". In another house the answer is: "I am a shoe maker". We begin to understand; in these houses the monks are grouped according to their crafts. There is organization! Then we meet a monk and make a bit of conversation. But the bell goes: "Excuse me" he says "but I must go!" So then, there is a rule too. Then we see the brother we visited make a small bow as another brother passes by. We ask him why. He answers: "That is the head of the house." There is a minor offical. A moment later he makes a deep bow, we are meeting the head of the monastery. A little further on he falls on his knees and prostrates. It is Pachomius himself, the Father of the whole Order. We are among the Pacomians, there is both an Order and order! There are 9 monasteries like this one, and everything is done the same way in each. It is very different from what we saw in Lower Egypt. 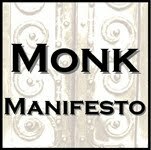 These monk are not hermits, they are cenobites. "The Roman Empire between the fourth and fifth centuries A.D. experienced the development of a new form of Christian piety--the rise of asceticism. Two models or disciplines of the ascetic life arose during this time period, coenobitic and anchoritic asceticism. While both were manifestations of withdrawing from society, these two disciplines differed in the way in which the ascetics lived: coenobites lived communally whereas anchorites lived in solitude.1 Anchorites practiced the ascetic discipline of fasting, prayer and meditation while living in solitude, scattered throughout the deserts of Egypt and in the steppe-lands and mountains of Syria. This expression of the monastic ideal rapidly spread from the homeland of its founder, St. Antony, to many Roman provinces, such as Palestine, Asia Minor, and Syria. There were men living as anchorites in Western Europe, but the dominant expression of withdrawing from society in that region of the Empire was coenobitic. Both Egyptian and Syrian asceticism in the fourth century developed out of earlier ascetic traditions in their respective locations. While the anchoritic life was equally as common in both provinces, the expression of the ascetic discipline, the askesis, differed between the two: Egyptian asceticism was considerably more mild than the discipline practiced by the anchorites in Syria. This was due to Egypt's severe deserts and harsh climatic conditions, forcing the ascetic to remain in his cell, where he practiced the central tenets of the askesis: fasting, prayer and meditation.2 Syrian asceticism, in contrast, was less hindered by that province's geography and climate, which was milder and more varied. The Syrians also developed a much more rigorous body renouncing tendency than in Egypt. While many differences existed between Egyptian and Syrian asceticism, there is one fascinating similarity between the two: asceticism in both provinces was an out-growth of martyrdom, filling the vacuum created by the adoption of Christianity by the Emperors of the Late Roman Empire." As auspicious as were the beginnings of monastic life in Nitria, Kellia, and Scetis, the first full flowering of monasticism lasted only a hundred years before two disasters shook the three settlements. By the end of the fourth century, a mere fifty years after Amoun and Macarius had gone out into the desert, Nitria may have had as many as three to five thousand monks. More important than numbers, the monks bequeathed a spiritual tradition that was to profoundly affect all of Christendom. The roots of this tradition can best be seen in the Sayings of the Desert Fathers, which probably had their origins in Scetis. In the original Greek, and then translated into Latin, Coptic, and Syriac, then Armenian, Georgian, Arabic, Ethiopic, and Old Salvonic, the Sayings deeply influenced both Eastern and Western spirituality. But the vitality of the tradition created internal tensions that by the end of the fourth century were fracturing monasticism, making it a house divided against itself. Then external forces attacked. The internal destruction came because of the theological conflicts over anthropomorphism and Origenism at the very end of the fourth century, while the external devastation came shortly after at the hands of barbarian raiders at the beginning of the fifth century. Apparently there had long been tensions between the more educated Greek-speaking monks and their simpler Coptic brethren. The Greeks (with Evagrius of Pontus as their spiritual leaders) tended to follow the thinking of the great exegete and theologian Origen of Alexandria (d. 254) and read much of the Bible figuratively and allegorically. The Copts tended to be more literal minded. Theophilus, bishop of Alexandria, in his Easter Letter of 399, condemned the more literal interpretation, called anthropomorphism, that understood God as having human speech, emotions, and parts. 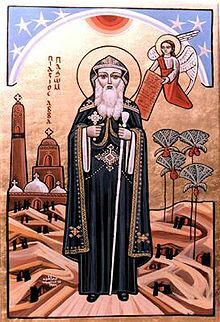 Many of the monks of Nitria and Kellia applauded this decision, but according to John Cassian it "was received very bitterly by almost every sort of monk throughout Egypt. At Scetis only one of the four congregations would allow the letter to be read. One old monk, on hearing of the condemnation of anthropomorphism, reportedly cried out, "Ah the misfortune! They've taken my God away from me. I have no one to hold on to, and I don't know whom to adore or to address". The Church historian Socrates reports that as a result of Theophilus' Easter Letter, the monks "left their monasteries and came to Alexandria where they raised a tumult against the bishop, accusing him of impiety and threatening to put him to death. As a result, Theophilus did an abrupt about-face and condemned Origenism. Some 300 monks, including the four learned and famous Tall Brothers, then fled Nitria for Palestine and Constantinople whre they embroiled the beleaguered bishop, John Chrysostom, in further conflicts. Nitria, Kellia, and Scetis, though damaged, would have survived such turmoil (especially Scetis, which was less affected by the Origenist exodus), but just a few years later, in 407, the Mazices, Berber invaders from the western desert, devastated Scetis. Three years later, in 410, the year of the sack of Rome, invaders struck again; in one of the more poignant exclamations in Church history, one monk reportedly cried out, "The world has lost Rome; the monks Scetis." A third Sack occurred in 434. Each time the monks returned and rebuilt, at least to some extent, and, beginning in the fifth century, they started to add fortifications, but Scetis lost many of its most eminent monks: Moses the Black and seven companions were slain; John the Little and Bishoi, founders of two monasteries in the Wadi Natrun, fled and died soon in exile. The small communities forming around the Desert Fathers were the beginning of Christian monasticism south of Alexandria, Egypt. Initially Anthony and others lived as hermits, sometimes forming groups of two or three. Small informal communities began developing, until the monk Pachomius, seeing the need for a more formal community, established a monastery with rules and organization. His regulations included discipline, obedience, manual labor, silence, fasting, and long periods of prayer—some historians view the rules as being inspired by Pachomius' experiences as a soldier. The first fully organized monastery under Pachomius included men and women living in separate quarters, up to three in a room. They supported themselves by weaving cloth and baskets, along with other tasks. Each new monk or nun had a three year probationary period, concluding with admittance in full standing to the monastery. All property was held communally, meals were eaten together and in silence, and twice a week they fasted—each wore simple peasant clothing with a hood. Several times a day they came together for prayer and readings, and each person was expected to spend time alone meditating on the scriptures. Programs were created for educating those who came to the monastery unable to read. Pachomius also formalized the establishment of an abba (father) or amma (mother) in charge of the spiritual welfare of their monks and nuns, with the implication that those joining the monastery were also joining a new family. Members also formed smaller groups, with different tasks in the community, and the responsibility of looking after each other's welfare. The new approach grew to the point that there were tens of thousands of monks and nuns in these organized communities within decades of Pachomius' death. One of the early pilgrims to the desert was Basil of Caesarea, who took the Rule of Pachomius into the eastern church. Basil added to the rule by integrating the monks and nuns into the wider community, with monks and nuns under the authority of a bishop and also serving the poor and needy.